I absolutely love the French film version of the Beauty and the Beast (La belle et la bête 2014), and if you do have a chance, try to catch it! A BIG disclaimer on the term “Barbarian”. You will see in a separate post with more explanation but basically, it’s not that I agree with that term, but that’s really how the ancient Chinese perceived anyone beyond its land. But firstly, on to Belle Wang. There’s a short English animation on youtube that does a good job at telling the conventional story–you can watch it HERE. But its verity in history is questionable, so will do my best to provide a more balanced story. Essentially, the story set in an era of frequent warfare between China and its western and northern neighbour for the last 100 years, about 2000 years ago. When Han dynasty China was still powerful, the nomadic confederation Xiongnu was having internal strife and divided into 5 tribes, and the Chinese army eventually defeated the remaining one tribe that opposed the Chinese rule, bringing peace to the region for a while. However, as we all know, political stability between nations is never guaranteed unless there are tangible things that bind them together, or if there are some sort of alliances made between them. Wang Zhaojun, in this case, was seen as the icon of sacrifice that the Chinese made in exchange for peace and stability at its border for some 60 years. So let’s have a look at the parallel universes. The flower in her hands is not just any flower but a Camellia. There’s a special breed of camellia in Japan that’s named after Wang Zhaojun (Camellia Japonica ‘Osyokun’ 王昭君). 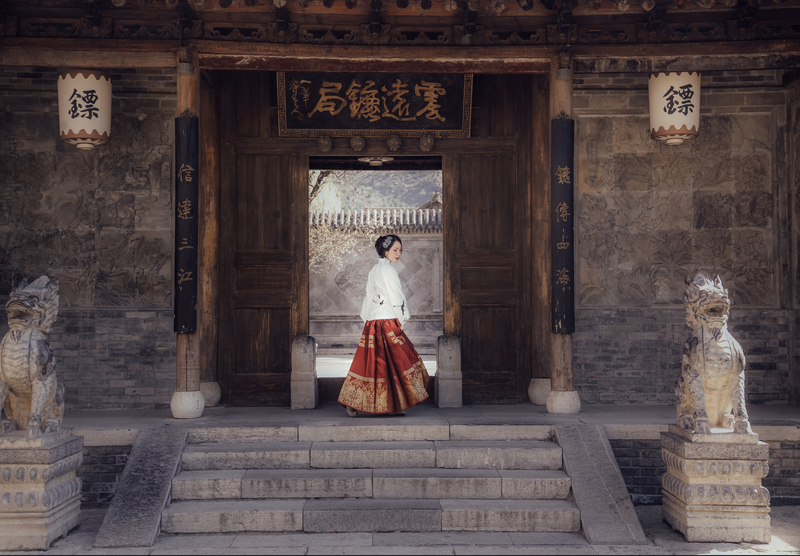 Very much like Belle, Wang Zhaojun grew up in a comfortable household (nothing dramatic) and was recruited into the palace as a palace attendant, or as some other version of the story goes, she was the lowest level of royal consort. So it was true that he never knew about her because there are hundreds and thousands of attendants and consorts. There was an old wife’s tale version of how she refused to bribe the court painter when he went around painting portraits of the various consorts, and therefore he painted an unfavourable portrait of her by adding a mole on her face. As such, the emperor just dismissed her portrait without much thought. In reality, I am inclined to believe that it is yet another romanticised story to illustrate her virtuous side, instead of a real event. Paper was said to be one of China’s biggest inventions modifications, and it first surfaced some 100 years before Wang Zhaojun’s story. But looking at artefacts from the era, most paintings were still done on silk scrolls or on walls. One roll of silk cloth (measuring about 1m x 10m) would have the equivalent value of 720kg of rice in those days–THAT’S A LOT OF MONEY! And the emperor would have had hundreds of attendants/consorts to be painted, so it would’ve not only cost him a fortune, it would also most likely cost him his empire! Furthermore, it was not fashionable to do photo-realist works in those days, and paintings from that era were mainly made up of lines and large areas of colours–extremely stylised. Above are parts of two paintings which spanned from 200 BC to 400CE, and you could see how it is impossible to judge one’s looks from a painting. So it is also unlikely also that the emperor would trust a painting for the assessment of someone’s beauty, and also unlikely that a mole’s going to make a difference if anything! The story of the painter was not found in historical records of that era, instead, it was found in a fictional novel written some 200 years later. Strategic. That’s how I would describe Wang Zhaojun over and above her apparent altruism. Pretty much like how Belle thinks that she could find a way to escape, Wang Zhaojun wanted to escape from the Han royal court too and she figured that by going to the land far far away, she would have a chance at freedom. According to the Book of Later Han, Zhaojun spent such a long time in the palace without a chance to meet the emperor, that she became frustrated. So when the opportunity arose for her to leave, she was quite decisive about it. She probably figured that it’s better to be a big fish in a small pond than a small fish in a big pond. But because this record was written some 300 years after, we might only be able to take this with a pinch of salt. Old wife’s tale would have you believe that one of the “physical flaws” of Belle Wang is her slopey shoulders, and that’s why she often liked to wear a hoodie/cape to hide her shoulders. But… the irony is that was kind of the defining features of beauties back in the ancient times! So this old wife might’ve been a new wife’s tale instead! Also, if it’s cold and windy, you would naturally put on hoodies/cape. Not everyone’s like me/us–wearing hoodie/cape in hot and humid Singapore and turning on the aircon just to take pictures! It must be said, however, that besides this aspect of pragmatism, altruism had to be the underlying force for her decision as well. One has to understand that to the Chinese, everyone else is/was (I’ll let you decide on the right tense :P) barbaric, and the living environment with the nomadic tribes would’ve been quite harsh due to the climate and their limited resources. Throughout the history of China, one of the more benevolent punishments (which coincidentally was formalised during Han dynasty, the period Wang Zhaojun’s in), was to exiled the criminals. So for Wang Zhaojun to decide to brace the harsh environment and marry the Xiongnu king, it would be akin to self-exiling and banishing to a god-forsaken place. Very much like how Belle decided to face the Beast in a godforsaken palace hidden away from civilisation. There are others who believe that since the records never mentioned that she volunteered to be given away, she was simply just executing what the emperor told her to. Especially since being a woman, and one from a humble background, meant that she really wouldn’t have much say in those days, let alone when it’s got to do with the fate of a nation. Back in those days, any pluck-string instrument is called Pipa, and it was believed that pipa took the shame of Ruan (round shape) instead of the tear shape, so perhaps Sanxian is my compromise! I’m not a music instrument historian, so please feel free to correct me if I’m mistaken! In popular culture, it’s always been said that Wang Zhaojun was carrying a pipa and playing really sad songs on her way to marrying the “Barbarian” king. And a modern pipa in the shape of an arc-shape tear-drop is often used. But it is also likely that she might be carrying an instrument closer to the Sanxian, which was said to be an instrument indigenous to China. Especially since pipa in its current shape probably didn’t date so far back. So while Belle dances, Wang Zhaojun plays the instrument! Clearly my model didn’t know how to play the San Xian… and I overlooked it in this shot! Well, what can I say–Fake it till you make it! It might seem racist/cultural supremacist to call the nomadic tribes like Xiongnu Barbarians/Beast, but that’s the reality of what things were like 2,000 years ago when the Middle Kingdom pride itself on its state of development and regarded anything beyond as barbaric. China was to continue having this mentality for the next 2,000 years despite multiple invasions and rule by the nomadic tribes. Literature romanticised the episode of Wang Zhaojun leaving the Middle Kingdom with series of associations such as the woeful melodies of pipa, the fallen migrating geese, and the camellia flower! Wang Zhaojun is regarded as the guardian goddess of November’s flower which is the camellia (the Chinese dedicate each month of the year to a type of flower, and with that, a guardian goddess/god). It was said that she brought a camellia flower on her way to the bleak environment beyond China, and the flower symbolised her love for her country and her strength. Most of the female characters in traditional Chinese painting did not look into the viewer’s eyes. Similar to the idea of the male gaze in western art, I have decided to have her looking at the camera directly. Most mainstream narrative of Wang Zhaojun would talk about her sacrifice and how she probably lead an unhappy life, away from her family, the comfort of her home etc. There were even saying that she requested to return to the Middle Kingdom after the demise of the Xiongnu King and that the Chinese emperor who gave her away died of a broken heart a few months after. The truth couldn’t be further from the truth. Belle Wang was only about 20 years old when she was sent to marry the Xiongnu king, and the emperor of China was about 42 when he passed away–people those days didn’t live very long. In the entire history of China, since the first emperor Qin Shi Huang, only about 30 lived to beyond 60 years old. Most of them had a lifespan that spanned from 20 to 40 years old. But when Wang Zhaojun married the Xiongnu king, he too was in his 40s and passed away some 2 years later after their marriage. According to Xiongnu’s custom then, Wang Zhaojun then married the next king, who would be about the same age as Wang Zhaojun. Belle not only had a wonderful husband of comparable age, she would’ve also enjoyed a great amount of respect being a Chinese princess to Xiongnu, and also the empress to two kings. The new king and Belle Wang lived happily ever after with 2 lovely daughters. Did you know, my model shares the same hometown as Belle Wang Zhaojun! What are the chances~ 🙂 Now, you can imagine seeing her as the reincarnation of Wang Zhaojun! Also fun fact, apparently Rouge was brought in to China around Han dynasty (2000 years ago) through Hungary. And its popularity and widespread use was thanks to the Beast’s cordial relationship with the Chinese!